A bottle of Veuve Clicquot thought to date from 1839, found on a shipwreck at the bottom of the Baltic in 2010 has been part of a tasting of old vintages at Veuve Clicquot’s Hôtel du Marc headquarters in Reims, writes Giles Fallowfield. At the tasting there were eight wines to try starting with the yet unreleased 2008 Yellow Label white and rosé bases, continuing with La Grande Dame Rosé 1988 (magnum); La Grande Dame 1962; Yellow Label 1953 in magnum; Vintage Rosé 1947; Vintage 1904 and finally the wine from the Baltic, Clicquot’s archivists believe dates from 1839. 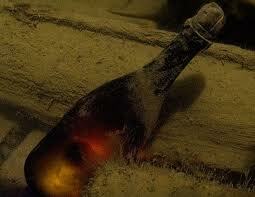 This bottle of Veuve Clicquot Champagne had been lying at the bottom of the Baltic Sea in a ship that sunk near the Åland Islands in the first half of the 19th century and came from a batch of 145 successfully salvaged Champagne bottles, all of which were tasted by expert tasters including wine writer Richard Juhlin, with some 79 being assessed as “drinkable” and re-corked.